You’ve (hopefully) seen the emails. Tomorrow, August 15, 2018, Marketo’s updated data retention policy goes into effect. But what does this mean for you and your Marketo data? The new data retention policy has two parts, high volume activities will now only be retained for 90 days and then deleted. Other lead activities will be retained for 25 months and then deleted. The only exception to this is new lead activity – you will always be able to see in your activity log when and how a lead was created. If you need to retain more of this data beyond the specific time constraints you have a couple of options. You can bulk extract the data periodically and store in another system (see here for more information on the bulk extract API). The main limitation to the bulk extract API is a daily export allocation of 500 MB. If you plan to export extremely large files, an upgrade in export size will be necessary. The date range filter also maxes out at 31 days, depending on how far back you want the data to cover. 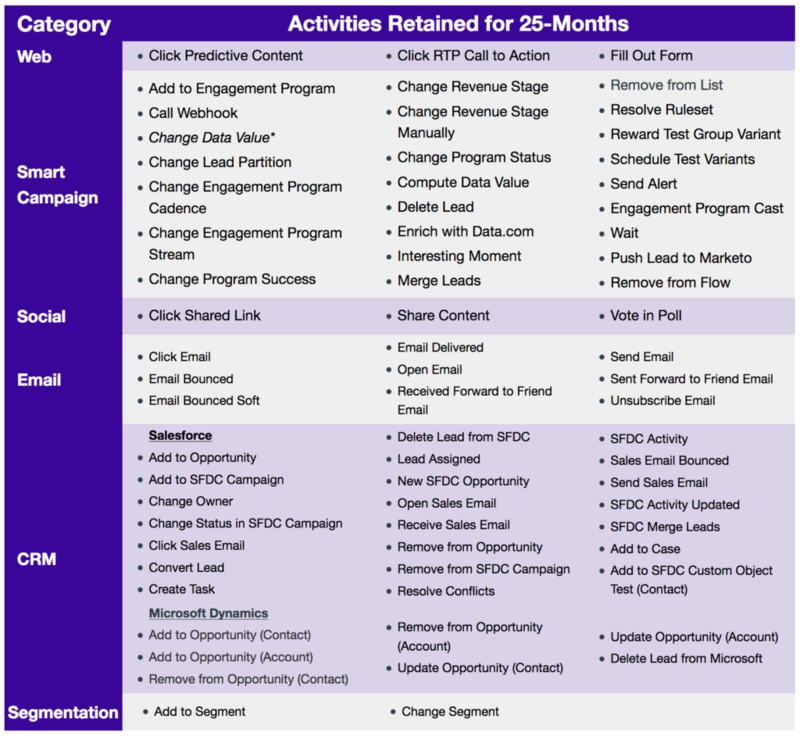 Your other option is to upgrade to Marketo’s premium Extended Data Retention subscription, which will extend your 25 months worth of data to 37 months. Overall, the effect of the data retention is two fold. Beyond ensuring that your data is compliant with GDPR, you could see speedier load time in Marketo with less data to sift through. Depending on usage, you may see faster email sends, faster smart list processing, and faster campaign execution overall. The other area where you’re going to see changes are smart list filters and flow steps where you can filter by an activity within a certain time period – those actions will only apply within the data retention period. Similarly, for engagement programs and smart campaigns, you will only be able to see membership within the data retention period. To workaround these limitations, think through specific activities you want to record and try creating static lists or trigger campaigns (with custom fields) to update when specific activities occur. That way you can still segment based on this activity after the data retention period is over. Have questions about how to retain your data? Need help exporting high value data so your reports stay clean? Contact Leadous, we can help!